Christ the King Jesuit College Prep alumna, Mya Peters was recently awarded a prestigious Fulbright Grant by the U.S. Department of State, as part of the English Teaching Assistant (ETA) Program. This program places Fulbrighters, like Mya, in classrooms abroad to provide assistance to local teachers. ETAs teach English as a second language while serving as cultural ambassadors for the United States. Ms. Peters was the recipient of a full-tuition leadership scholarship through the Posse Foundation to attend Trinity College in Hartford, Connecticut, graduating in 2018 with her BS in Psychology. Mya was the first in her family to attend and graduate from college. While at Trinity, Mya had the opportunity to spend her junior year studying abroad, in Argentina her fall semester, and in India, South Africa, and Brazil in the spring. Those experiences helped trigger her interest in living and working in a foreign country, and applying for the Fulbright Grant. Since returning to Chicago after college, Ms. Peters has worked as the Midwest Campus Engagement Representative for Diversity Abroad, and as a Community Engagement Consultant for Westlawn Youth Network. She recently accepted an Executive Management Fellow position at Chicago Scholars, where she’ll work until departing for Thailand. 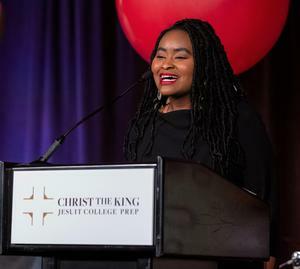 Her younger sister Jenelle, a current senior at CTK, is following Mya’s lead as a recipient herself of a Posse full-tuition scholarship to attend St. Olaf College in Minnesota. “Mya and Jenelle Peters are great examples of what’s possible through hard work and seizing opportunities. They both embrace and act on a key Jesuit characteristic of CTK graduates, of being open to growth,” shared CTK Principal, Temple Payne.